Above: Hoffy starts to aclimatise to the cold water again by swimming in Dover Harbour on Saturday Novemer 03, 2007. While most people were lighting bonfires and watching fireworks on a cool November weekend, the Hoffy's made their way to Dover, to perform the last act of my 2007 Channel Swim, and start preparations for the 2008 Two Way in style. Arriving before lunch, we went straight down to the harbour and I was really surprised to see the harbour, and indeed the channel itself, the calmest that I have ever seen it. It was so calm, that I wished I could swim the channel again there and then! The temperature was OK. At 14.1 Degrees Centigrade, it was only 0.9 Degrees colder than the day I swum the channel! It was still cooling down from the summer. I completed 2,000 Metres in 35 minutes and felt pleased that I had been in the sea again after my break. 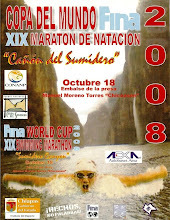 Little did I know that this would be my last swim for many weeks due to a bizarre injury just 3 days later. 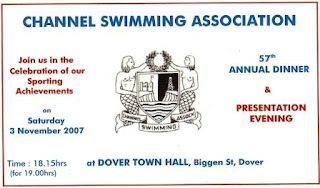 Having showered, and put on our gladrags, we took a taxi to Dover Town Hall to attend the Channel Swimming Association 57th Annual Dinner & Presentation Evening. It brought back memories of last years event, which we attended to gather as much information as possible to help in my preparations for the channel. 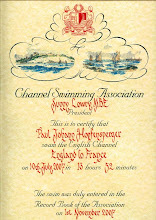 This year I was back as a "Channel Swimmer", and was presented with my certificate by Sunny Lowry MBE, the president of the CSA who swum the channel in 1933, and who retired from her post the following day at the age of 97 years young. 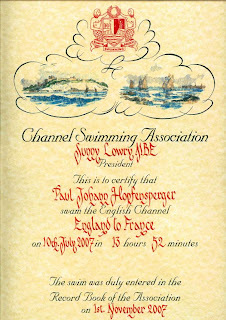 Above: Sunny Lowry MBE presents Hoffy with his certificate of completion (see below) for his channel swim. Above (left to right): Mike Read, Chairman of the CSA, Rebecca Hopfensperger, Hoffy and Little Hoffy after the certificate presentation. 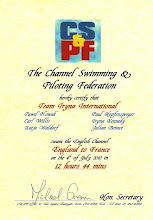 Above: Certificate certifying that I swum the channel on July 10, 2007 in 13 Hours and 52 Minutes. The following day, we were delighted to collect a cheque from Jimmy Gleeson of Cullins Yard in Dover who became the title sponsor of my Two Way Channel Swim 2008. We always eat and drink there during our weekends in Dover training for the swim. I would like to say a big thank you to Jimmy for agreeing to sponsor me. Above: Jimmy Gleeson present Hoffy with a cheque to become the title sponsor of the 2008 Two Way Channel Swim. The last task before leaving for home, was to visit Evelyn and David at Varne Ridge where we stayed during my channel swim week, to look at my name on their "Wall of Fame". 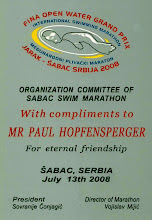 All swimmers who stay at Varne Ridge, and complete the swim, get their names on the wall. Some even get theirs spelt right! (look closely). Above: Hoffy points to his name (almost - should be "Hopfensperger" not "Hopensperger"!) 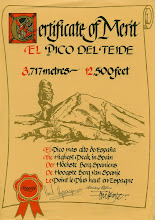 on the Varne Ridge wall of fame. 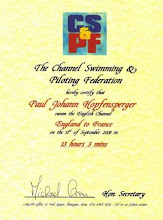 All in all, it was a good weekend, with lots achieved, and it was the final chapter of the 2007 Channel Swim. 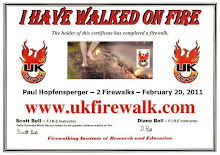 It has been an incredible journey, and a big thank you to all concerned, especially my wife Beccy, Little Hoffy, John Stemp and all the Dover beach crew and swimmers we have met. Now we must do it all again for next years two way. The new challenge begins!